This easy chocolate mousse really is a favourite! A melted semi-sweet chocolate mixture is thickened with unflavoured gelatine and blended with whipped topping for an easy and airy dessert classic. 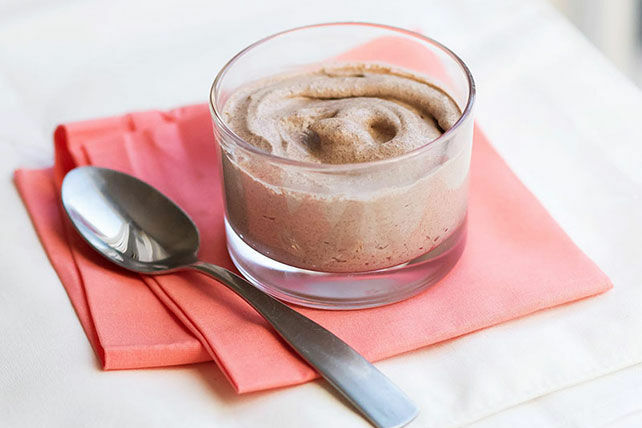 You can't go wrong with this 15-minute chocolate mousse! Sprinkle gelatine over milk in medium saucepan; let stand 1 min. Cook on low heat 3 min. or until gelatine is completely dissolved, stirring constantly. Add chocolate; cook 5 min. or until chocolate is completely melted and mixture is well blended, stirring constantly. Blend in vanilla. Place saucepan in large bowl of ice water. Stir chocolate mixture 3 min. or until slightly thickened. Pour into large bowl. Gently stir in Cool Whip. Spoon evenly into 12 dessert glasses. Prepare as directed, substituting 1 pkg. (170 g) Baker's White Chocolate, chopped, for the dark chocolate.